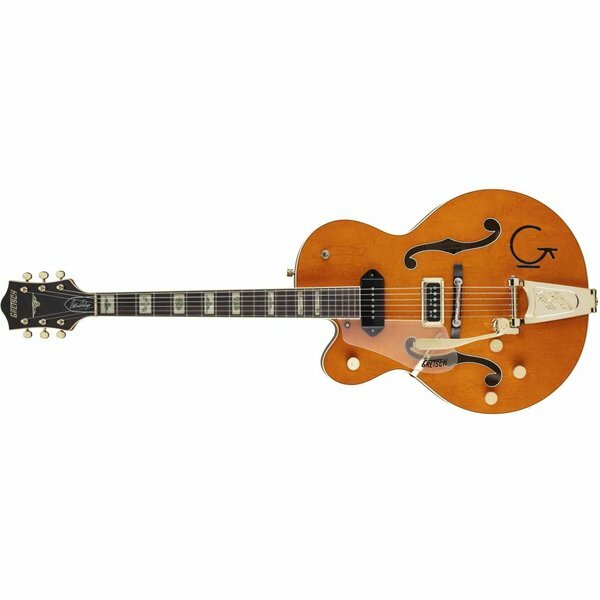 Gretsch honors the legacy of rock 'n' roll and rockabilly pioneer Eddie Cochran with the G6120 Eddie Cochran SIGNATURE Hollow Body model, based on the distinctively modified guitar that fueled Cochran's highly influential and all-too-brief career. Distinctive elements include a special "open" internal body design and the unique combination of a DynaSonic single-coil bridge pickup and Lindy Fralin "Dogear" single-coil neck pickup. Features include a three-ply arched maple top with parallel bracing and double-bound F Holes, three-ply arched maple back and three-ply maple sides, two-ply body binding (white-black), two-piece maple neck, single-ply binding, polished brass nut, 9.5"-radius 22-fret rosewood fingerboard with western-themed cactus, steer head and fence pearloid inlays, single-ply headstock binding, translucent plexi pickguard with Gretsch logo, "G-Arrow" control knobs, compensated aluminum bridge with rosewood base, Bigsby B6GBVF tailpiece, gold and polished aluminum hardware, gold-plated Grover V98G Sta-Tite tuners and a deluxe hardshell case.